Previously, we saw Android running on an iPhone 2G and we also posted a complete step by step guide on how you can dual boot your jailbroken iPhone 2G to run Android OS side by side with iPhone OS. After seeing Android run on an iPhone 2G, 3G (iPhone) users got curious on when they will get to try Android on their handset. After weeks of hard work, it’s finally done! 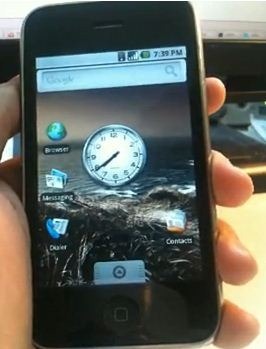 iPhone 3G now runs Android. Porting Android to iPhone 3G wasn’t as easy as it was for iPhone 2G. But the great thing about it is that it is done and almost everything works as it should. In fact it works so well that you will actually feel that you’re using a “real” Android device. We’ve also made several other improvements to the original port in this version. Along with many under-the-hood improvements and bug fixes, the Wi-Fi driver has been fleshed out with all the Android-specific extensions, making it more stable and reliable. We’ve also added an Android icon to the boot menu to make it more easily accessible..
Few things which still needs working is the audio support, which is currently not working for apps. But the groundwork for that has been laid. Improved power management settings and backlight controls will also be added before the final release. Hi. I've a 3G Iphone Jailbroked but not unlocked. Does anybody knows if is possible to unlock the iphone running Android? Excellent, Im avidly looking forward to this. Thank you planetbeing and others. can you run Android of iphone 3GS??? Awesome, so perhaps this will be a better alternative for the lack of Flash support on the iPhone OS? At least then audio is enabled. Yes, is this version compatible with the 3gs or us users going to have to wait for a new image?